The purpose of this article is to serve as a general strategy guide with tips and advice that you should follow when attempting to win a large hot dog challenge. There are two basic types of hot dog challenges. Some involve eating a large quantity of regular sized hot dogs (usually specialty dogs loaded with toppings), but many hot dog challenges involve eating just one very large specialty hot dog, typically served with a side item. Large hot dog challenges typically range from eighteen inches to three feet in length, and are usually loaded with toppings such as chili, cheese, onions, jalapenos, coleslaw, pulled pork, bacon, and many other possible items. The most popular side items included with large hot dog challenges are french fries and/or onion rings. Even though there are many different variations that you may encounter, the basic strategy that you need to have remains similar for every variation. Before we go into the specific strategy details for winning a large hot dog challenge, please make sure you have read and understand our Basic Strategy For Winning A Food Challenge article. That article is full of 14 different basic strategy tips that will not be included in this article, which you also need to understand before attempting a large hot dog challenge. Please start off by watching our very informative How To Win A Hot Dog Challenge video so that you can visually see all of our different tips put into practice during an actual large hot dog challenge. 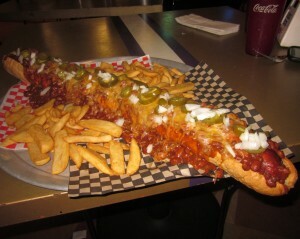 For this video, I attempted The Big Dog Challenge at University Dogs in Decatur, Illinois. In this challenge, there are two foot-long hot dogs totaling two feet long because the restaurant cannot get 2′ long hot dogs or buns, which is fairly typical. The challenge includes a one pound side of their Disaster Fries which is basically french fries covered with chili, cheese, and onions. I had 30 minutes to finish everything and get the free meal and shirt. 1. Focus on eating the actual hot dog meat first – Like most food challenges, you want to focus on eating the heaviest and most dense part of the challenge first, which is the hot dog meat itself (in most cases). You also want to eat the meat while it is warm, juicy, and delicious, before it gets cold, dry, and loses most of its flavor. 2. Eat most of the meat before changing things up – As mentioned above, you want to focus on eating the meat first because that makes up a majority of the challenge. Once you are finished with that, it is all downhill from there. You may choose to start including other parts of the challenge though once you get 3/4 finished with the hot dog meat to change up the flavor on your fatigued taste buds. You may even want to save part of the hot dog and begin eating some of the bread and toppings just to get them down while you are still feeling pretty good. The choice is really up to you and your preference, based on your eating style. Just know that you don’t have to eat the entire hot dog first, but it is definitely recommended that you eat most of it before changing things up. 3. Use the creamy toppings to help get the bun down – The size of the bun and type of bun is definitely the largest variable between all large hot dog challenges around the world. Some buns are really thick and chewy while some are pretty easy to bite and swallow, and then there are others in between. For many large hot dog challenges, the meat may be the heaviest part, but the bread is the hardest part to eat simply because of how thick and chewy it is. You may choose to “dunk” in situations like this, but if you are not a fan of “dunking” or the challenge rules do not allow you to, there is another much tastier solution that you that you can use. A majority of large hot dog challenges are loaded with creamy and “runny” toppings such as chili and coleslaw. Keep all of those toppings inside the bun while you are eating the meat, and then eat those toppings with the bread. The liquid in those toppings will help soften the bread and make it easier to consume. This will save you from having to dunk or drink a lot of excess, unrequired liquids to get the bread down, saving you much needed room in your stomach for the side items and rest of the challenge. Be careful though, especially if you know your challenge will last over 45 minutes. As time continues, the chili will cool off and eventually become cold. When nearing capacity, if your taste buds won’t enjoy bread soaked with cold chili, even when “chasing” each bite with liquid, then you need to address that problem early and get the food down before issues can occur. 4. If the hot dog is “thinner” then you may eat it all at once – As mentioned previously, the size (length and diameter) of the actual hot dog meat varies between restaurants and who their suppliers are. Some hot dogs are a full 1.5 inches or more in diameter which is very thick, and then some are very long, but the diameter is much thinner, almost like that of a regular sized jumbo dog. Also, as mentioned up above, the size of the hot dog bun varies too. Some restaurants use many regular sized foot-long buns, and some use entire baguettes which are much thicker. If you are attempting an extra long challenge involving a thinner hot dog with a thinner, regular sized bun, you may choose to just eat the hot dog all at once. Just start on one side and end at the other. It is still recommended that you eat the hot dog meat first, but if if you aren’t very worried about your time, and are more worried about enjoying the taste, eat it like a regular loaded hot dog. It will be tougher to eat quickly, but all of the toppings will help you get both the meat and bun down together which will keep your jaw from getting tired, and the challenge will most likely be much tastier. If the meat and bun are so thick though that you can’t even get your mouth around one end, then it is especially recommended that you break the challenge down based on our strategies mentioned in this article above. If your maximum stomach capacity level exceeds the size of the challenge your are attempting, then you can have a much “looser” eating strategy. That is why Stomach Capacity Training is so very important and vital to being successful at winning food challenges!! 5. You may choose to dunk if the bread is really thick – If the bun is just so thick that it would take forever to chew and swallow normally, even with sipping on liquids after each bite and using the creamy toppings as mentioned up above, then you may choose to dunk the bun in your favorite liquid if the rules allow you to. Just make sure to not be gross and disgusting about it. Don’t soak the bun and then drip liquid all over your tray and table while putting the pieces in your mouth. Have manners and use proper eating etiquette. You may choose to use whatever liquid you want, and even water if your taste buds can handle that. I can’t stand dunking food in water though, so I use lemonade and fruit flavored sports drinks whenever I have to dunk my breads in order to win. The choice is up to you and your preference. I don’t like to recommend dunking, but if the restaurant chose to use a type of bread that is so thick and chewy that you can’t even enjoy it, then dunking is what you have to do to compensate for that. If you are going to dunk, you may want to make sure to scrape off all of the toppings off the bread first and eat those with the meat or separately. Bread covered in coleslaw and chili and dunked in liquid probably won’t taste very good. You may also irritate the owner by dripping food into the “dunking” cup. If you combine the tips above with the Basic Strategy Tips For Winning A Food Challenge, you have all the major advice that you need to plan the strategy you will use to dominate your next large hot dog eating challenge.